On the way back to the city, Mannix and Khaless wanted a little private time with the Sending Stone they had lifted off Liara Portyr. They sent off a message to the unknown owner of the paired stone, with Khaless pretending to be Liara. The message they received back seemed to know their deception, however, hinting that Liara had used some kind of passphrase as a security measure (also Khaless rolled crap on the Deception check!). While they didn’t learn anything knew, they were willing to give Rokah the stone and notebook to complete the quest. Rokah hinted that he could work with the PCs in the future if he learns anything more about the Pirates, and the PCs accepted this outcome. When they reached the city harbor he handed over the payout of 50gp. Plus the big haul from Liara’s lockbox, that’s 54gp per person. Not bad for a single session with almost no combat! It was evening when the party returned to Port Nyanzaru, so they went to the Temple of Savras to follow up on the ritual results with Grandfather Zitembe. Zitembe was harried from the 24-hour ritual, but he regaled the bits and pieces he had learned. It was mostly confirming that my PCs’ personal quests were indeed in Chult, but they didn’t learn any exact locations. Artus Cimber could not be located at all, Zagmira was somewhere in the jungle, and Siburrath may be near a temple by a beach. The Soulmonger had the most intriguing tease. Savras had pointed Zitembe toward a hidden city far to the south, and a black obelisk draped in vines. But Acererak showed up and psychically shoved him out of the divine guidance, leaving him shaken. The party was surprised when Inete, the young acolyte they had rescued from Viplo, demanded to join them, much to Zitembe’s horror. She claimed she had been given a vision from Savras. She saw red-robed figures pouring out a giant floating rock in the jungle, heading south. Savras identified it as the Heart of Ubtao, located somewhere in or around the Aldani Basin. Naturally the PCs were disdainful. I enjoyed that they instantly wrote her off as a naive teenager, which isn’t far from the truth. She’s not a Commoner, however; she does have some low level Cleric spells. Ultimately the party accepted her though none but Gillian felt any real affection or loyalty to her. Inete would be given the change to test her mettle right away. As the party left the Temple of Savras they heard alarm bells in the distance. They rushed toward the source – the southern most gates at Malar’s Throat. Throngs of people were rushing into the city gates, screaming about undead pouring out of the jungle. It was a simple matter to talk the guards into opening the gates and letting the PCs out to investigate the area. When they reached the large Temple of Tymora they finally spotted the action: half a dozen zombies, skeletons, and a ghoul were attacking people as they fled. Many ran toward the gates that the party had emerged from, while others attempted to get inside the Temple. Roll for initiative! This was a large-scale, straight-forward fight, probably the first we’ve had in our campaign. 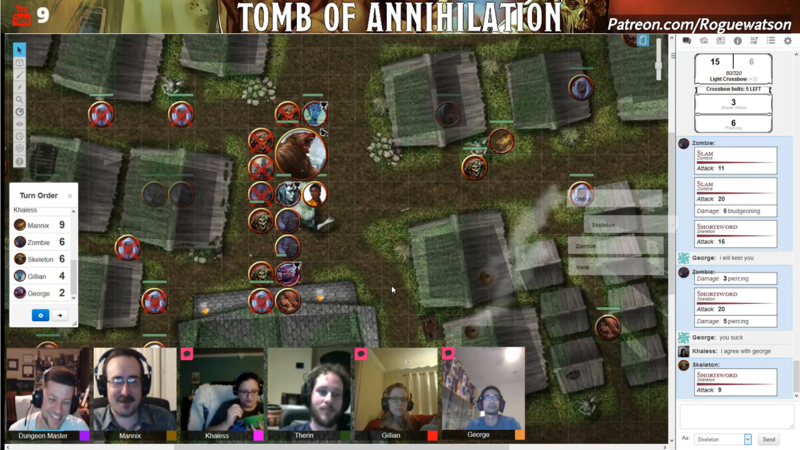 The party rushed into action, starting with Therin wild-shaping into a bear and taking on several of the undead at once. The undead cut down many of the poor townsfolk before they reached the center square, where the party was able to engage them. Gillian unleashed a Thunderwave while Khaless and George ran up to slice and dice. Mannix kept to the shadowy alleyways to shoot from afar, while Inete cast Bless and Sancutary before running up to apply Sacred Flame. I was astonished by how well I rolled throughout this fight. Zombies and Skeletons aren’t exactly strong but I was rolling 17+ on most attack rolls, dealing solid damage to everyone, especially Khaless and George. Therin-bear was forced to use his Wild Shape healing to stay topped off, while Gillian had to heal George who came dangerously close to falling. The only disappointment was the ghoul, the ‘boss’ of this encounter, who got off one attack before being completely destroyed but the multi-attacking Therin-bear! Eventually the PCs turned the tide. I had some surprises in store near the end, when Undril emerged from the Temple to briefly help the party, before explaining that she had been inside helping those who first arrived. She warned to watch the bodies of those who had fallen. Khaless hurried to burn them after the fight, noting that the last one started to rise as a zombie! Is the Death Curse creating a zombie apocalypse scenario? Dun dun duuuunnn! When folks die they cannot be raised, the soul is being drawn into the Soulmonger. Apparently the body can rise as an undead horror. This is definitely not how undead are normally created in D&D (which I made sure to explain). The party quickly picked up on the horrific ramifications, noting that the city could quickly tear itself apart, and/or create a panic. They worked with the temple and the guards back at the gate to discreetly warn them of what they had learned. The Death Curse was more than just an inconvenience, it was the beginning of the end. 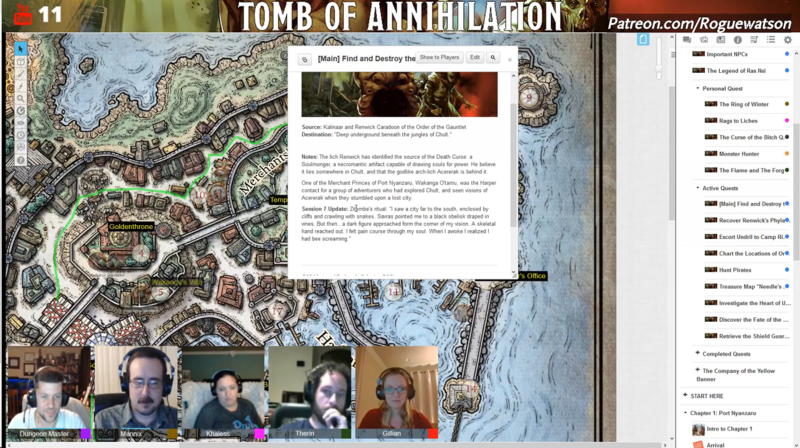 With the immediate attack repelled the party returned to the Thundering Lizard Inn for a much needed Long Rest, ending their second full day in Chult. When they awoke they found a message had been left for them – the Merchant Prince Wakana O’tomu had invited them to meet with him at his Villa. Day three also brings the long-awaited and highly anticipated dinosaur races. All of this next week!